Hareidi religious Jews are more Zionist than leftist, and trust in Netanyahu is far higher than during the Olmert term, a new poll shows. 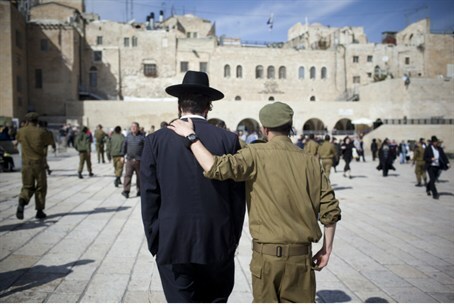 Self-described hareidi religious Jews are more Zionist than leftist, and despite mainstream media headlines, trust in Prime Minister Binyamin Netanyahu and the government is far higher than during the Olmert-Livni administration, according to a new poll. The survey also shows that leftist and middle-to-upper class people are more involved in “social protests” thaמ those who are relatively poorer. The leading sector that described itself as strongly or quite Zionistic was that part of the hareidi religious community that also defines itself as nationalist, with 62 percent in the Zionist category, followed by the religious, traditional and secular sectors. Another surprising figure was that nearly half – 44 percent – of Arabs with Israeli citizenship are “proud” to be Israelis, although nearly 50 percent are not. The figure of “proud” Israeli Arabs is in contrast to an increasing number of terrorists among the Israeli Arabs. The figures suggest that while the Arab community is split considering its identity with Israel, there is a deep anti-Israeli anger among a small but lethal minority among those who are not “proud” Israelis. The poll also contradicts images in mainstream media that the public does not trust the government and Prime Minister Netanyahu, and actually shows a far higher trust than during the period of Prime Minister Ehud Olmert. In 2008, only 16.8 percent of the public trusted Olmert, who at the time was under several investigations for alleged bribery and abusing the public trust, and only 25.1 percent trusted his government. The respective figures have been on a steady rise, and the latest poll shows that slightly more than 56 percent of the respondents trust Netanyahu and his government, far higher than in the first three years after the Likud formed the present government. In its survey of those participating in the movement of social protests, the IDD found that only 16.5 percent of the respondents with lower than average income participated in the demonstrations, while 40 percent of those with higher than average salaries participated. As expected, most of the protesters were leftists. Concerning the Palestinian Authority, the poll confirmed frustration among media and politicians that the “Peace Process” is dead and buried. Only 22.5 percent of Jews in the poll believe there will be an agreement with the Palestinian Authority in the next few years.